Edit Reason: Topic moved from the "Mac OS X System" forum to the "Networking" forum. Look in /Library/Internet Plug-ins. Also, check the Flash Player preference pane in System Preferences. Adobe's Flash Player is always installed as a plugin in whatever browser is used. It is also a portal for potential problems, so you can always set it to be used only on certain trusted websites and/or decide to activate at each and every site that requests it. Go to System Preferences and open the Flash Player pref pane. Select Advanced and then click Trusted Location Settings. You might also take a look at ClickToFlash...Safari Extension. CLICK TO FLASH does not play very well with El Cap . . . I noticed. Sometimes works; sometimes doesn't. So I uninstalled it. I'm still running Snowy, as is jaybass, but thanks for the update. For your purposes, ClickToFlash, to which I linked above, looks like your answer; it prevents Flash from loading and, instead, displays a place-holder on which you must click to see its content. I'm not sure what Jon is referring to with "Go to System Preferences and open the Flash Player pref pane. Select Advanced and then click Trusted Location Settings." It must be a possibility with Safari. I use Firefox. I agree with artie's comments. The optimal way of selecting a trusted site to allow Flash Player is to go to that site (which should always be a secure connection with https:// in the URL) and when it requests permission to use Flash Player, select the option to "allow and remember". That way your browser and your trusted site are always on the same "wavelength". You can also achieve the same effect by going to the site and clicking on the lock icon in the URL window which will then give you similar options under permissions. 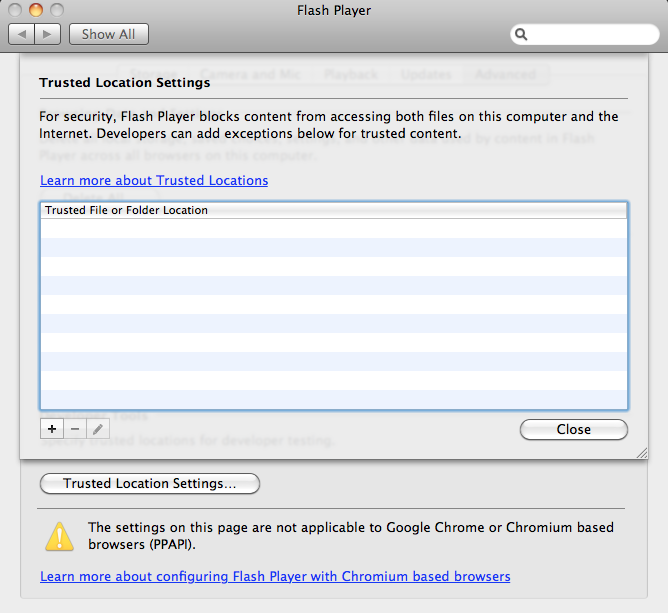 Jon's post refers to Flash's presence in Safari, and you've apparently described procedures that are native to Firefox. In my Safari 5.1.10, Flash content automatically begins playing when a page containing it loads...no pop-ups or locks with which to set prefs...presumably why ClickToFlash has been developed. Edit: CTF allows whitelisting of websites...what I believe jaybass is looking for. Ergo the difference in procedures. Thanks for the clarification. Odd that the two browsers are so disparate in their treatment of Flash Player, especially given the risks inherent in same. I'm running Safari 5.1.10; I wonder if v 9.x handles Flash differently? Safari 9 seems to handle Flash the same way. Although I haven't used all its features, they appear to be available. Your post sounds like "stop browser plugins from activating immediately" differs from "Block[ing] Autoplay". I just searched the Safari Extensions Gallery and ClickToFlash has apparently been removed. At least in Safari 9.0.1 on OS X 10.11.1 beta 4/5. With neither Flash nor ClicktoFlash installed, I experience the autoplaying of those Macworld videos—evidence that the page source code is written to utilize an alternative player if Flash is not present. I guess I'm viewing your ClicktoFlash case as a subset of the larger Flash not present category, rather than as a special instance of coding to evade blocking efforts by the user, but that's just a hunch based on the fact that online video is increasingly consumed on Flash-free devices. Generated in 1.850 seconds in which 1.426 seconds were spent on a total of 15 queries. Zlib compression enabled.